Although I might struggle to find the long term social good of having shoes that light up and tie themselves, I love it when science fiction becomes reality. You hear the same rumours every year: “Nike’s going to make the shoes from Back to the Future!” I’ve heard it so many damn times that I stopped getting my hopes up. But when Nike confirmed the project in January 2015, I flipped. The world also flipped, or at least anyone old enough to have seen BTTF 2 in theatres. Created by Nike designer Tinker Hatfield, the shoes for the film were originally scripted in Back To The Future to be created in 2015. And now he’s remade them. 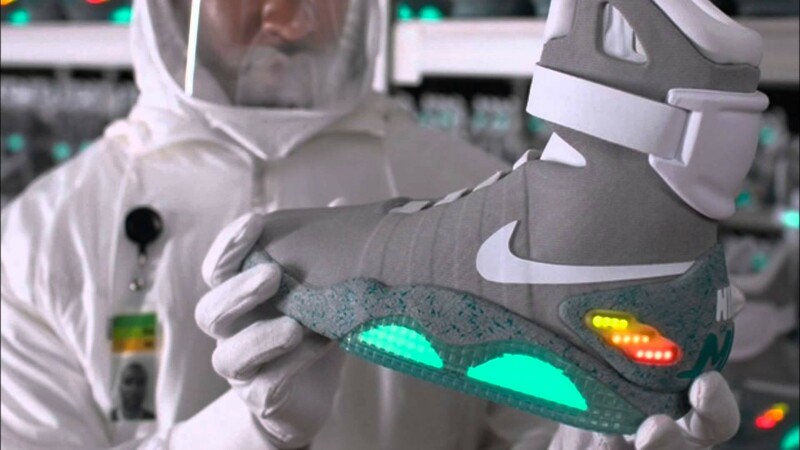 These aren’t some glorified homage that look like Marty McFly’s shoes. No, these things actually lace themselves up with ‘power laces’ technology. Nike got a patent for this technology that senses weight in the heel and tightens the seams appropriately. Honestly, my whole family will be rocking these shoes, including my 8- year old. It doesn’t get more ‘future’ than this. This was mapped by virtual reality producer Samantha Storr in her AtlasChart Top 5. Read her full FutureHero interview. Samantha is the Executive Producer behind Vrse and has realised the visions of Terry Gilliam, Chris Milk, Spike Jonze and Robert Redford. Tags: Consumerism, Fashion, Wearable technology.